If you read Difficult Run with any frequency, you know that we really, really don’t like the minimum wage. There are lots of reasons for this, but one of the biggest is that there’s a better solution to the problem that the minimum wage is supposed to tackle, which is helping the working poor. It’s better because it gets more money into the hands of those who need it without either (1) eradicating low-income jobs (which are better than no jobs) or (2) uselessly funneling extra money into the hands of middle class teenagers working summer jobs (or whatever). I may wish to have all jobs pay at least $15 an hour. But that minimum would almost certainly reduce employment in a major way, crushing many workers possessing only basic skills. Smaller increases, though obviously welcome, will still leave many hardworking Americans mired in poverty. Given the existence of the EITC, it is inexcusable for anyone who genuinely cares about this issue to keep shouting for an increase in the minimum wage. In a perfect world if I got to restructure our whole tax / welfare system from scratch I might make other choices than an EITC (like maybe an Universal Base Income), but in the world we live today the EITC is a smart, simple program that is already in place and just needs to be augmented in order to give targeted, sound support to the working power. In this case the smart thing and the right thing are the same: so let’s increase the EITC. You’ve probably heard a lot about the growing gap between average worker pay and CEO pay. This seems like a legitimate concern, but I’ve had some questions about the data and the assumptions ever since I first started hearing the statistics. I would kind of expect, for example, that CEOs of larger companies would probably get paid more. So if you had two companies with 1,000 employees each and they merged and you ended up with one CEO of a company that had 2,000 employees, do you think he’d get a raise? So consolidation (which might be a bad thing for other reasons) might inflate the average worker to CEO salary ratio in ways that aren’t necessarily that bad. 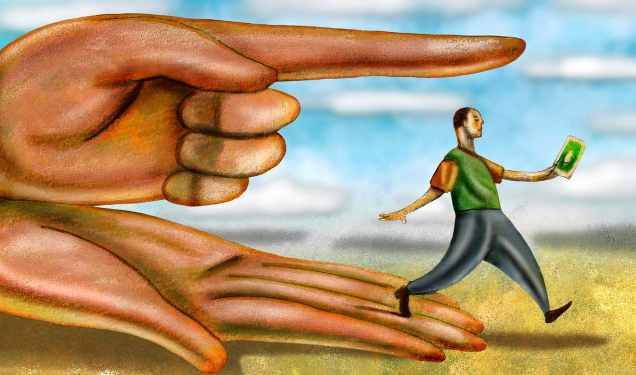 In any case, the American Enterprise Institute has a related critique of those figures. It turns out that most of them are based on a very small sample size (the WSJ looked at only 300 CEOs, the AP looked at only 337, and the AFL-CIO looked at 350). Not only are these samples small, but they’re also heavily skewed towards the biggest companies. And so, as the AEI points out, “Although these samples of 300-350 CEOs are representative of large, publicly-traded, multinational US companies, they certainly aren’t very representative of the average US company or the average US CEO.” Turns out, there are more than a quarter million CEOs in the country. Comparing average worker salary to the 350 or so from the biggest companies is like comparing average worker salary to the top 0.1% of CEO salaries. 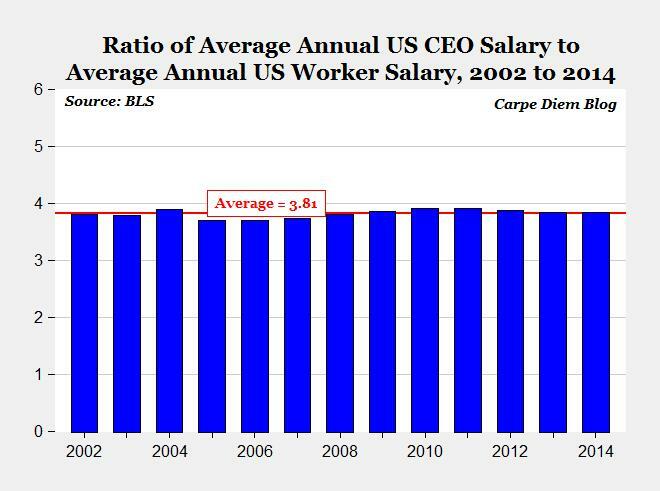 If you do compare average worker salary to average CEO salary (which can be done, the data is available), then the gap drops from 331:1 to 3.8:1 and the apparent growth over the last 13 years disappears. I think a realistic assessment of the statistics is important, but I’m not willing to go quite so far as the AEI: “We should applaud the richest 300-350 CEOs as a group of the most successful American business professionals.” I think there are real questions about whether CEO pay is really an accurate reflection of their contribution to the economy, and there are also serious questions about how compensation structure can create perverse incentives where high-paid executives take risky strategies that end up rewarding them when they win and penalizing the rest of us (via bailouts and economic downturns) when they lose. And do the top 0.1% of CEOs really need our applause? Aren’t their salaries enough? Ron Haskins of the Brooking Institution has an excellent piece in the Spring 2014 issue of National Affairs. 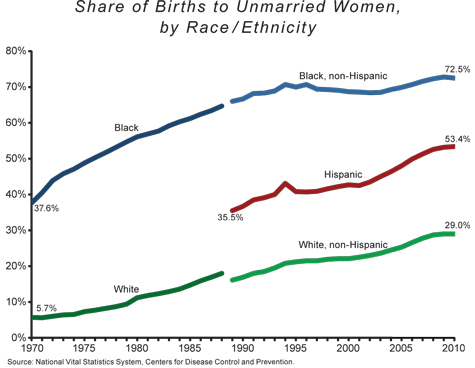 He begins by reviewing the current state of marriage and the rising rate of single parenthood in the United States. Furthermore, he looks at the impact single parenthood has on children, including the increased risk of poverty. One of the most useful things I learned about economics when getting my master’s was simply who to pay attention to. When I read an article and it references someone whose research was brought up not just once, but again and again in my classes, I know I’m reading about a serious economist. Well, this article is written by Bob Solow about a book by Thomas Piketty based on research he conducted with Emmanuel Saez and Anthony B. Atkinson. That’s the most big-name economists I’ve ever seen in a contemporary piece, so even though I had a busy day today I took the time out to read this article. This is pretty important. It’s important because it tells us that income inequality is going to continue to increase towards levels not seen since the late 1800’s. It’s also important because it explains why this is happening, and it does so in terms of cross-cultural, international, non-partisan (mostly) terms. It’s not as simple as the Democrats or the Republicans selling you out to corporate America (although that probably doesn’t hurt). It’s driven by fundamentals. Lastly, it’s important because it suggests a policy solution. Unfortunately, the policy solution is politically impossible. I mean, if you think that consumption tax would be a neat idea but you don’t think it’s realistic, that’s trivial compared to what would be required to combat this trend. Basically: you need to make capital less profitable. And that means you need to tax it. But, in order to be effective, this tax has to be international. Otherwise, if the UK taxed their capital, they would just be shooting themselves in the foot because all their rich folk would invest in French and American capital and legally avoid paying taxes. So not only would the EU, US, Japan (and others) all have to agree to an incredibly unpopular tax, they’d also have to figure out how much to tax, how to enforce it, and what to do with the revenue. As Solow (the one doing the review says): Not. Going. To. Happen. I have two unknowns of my own, however, which don’t come up in the model. First, I’d like to know more about the impact of international economic growth. We’re focusing on income inequality among people in the developed world. That’s what we tend to focus on because of what liberals would ordinarily call ethnocentrism. While income inequality in that sense of the word is rising, income inequality globally is actually falling, and has been for decades. This is because the poorest countries are getting richer (in aggregate) faster than the richest among the developed world are getting richer than the poor among the developed world. And this advance of the poor countries is not just the mega-rich within those countries. As China has shown (again), you don’t get sustained economic growth without creating a middle class. The rise of the rest (as Fareed Zakaria dubs it) has important economic, ethical, and policy implications. But my biggest concern with this whole article is the focus on income taxation. 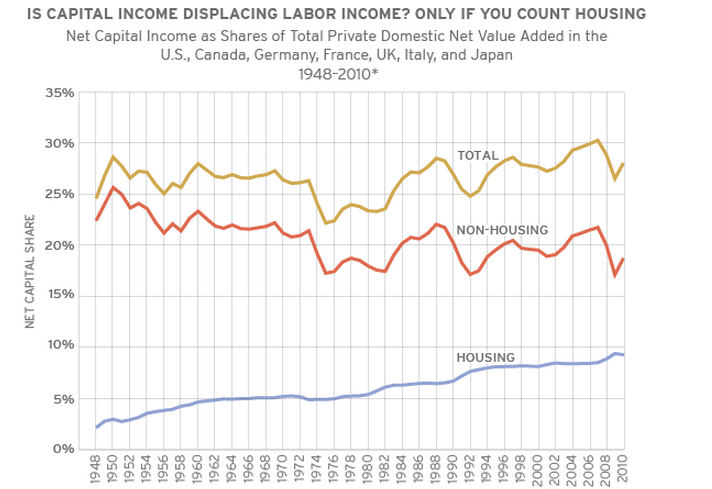 In simple terms, you have to tax capital-based income so that it looks like labor-based income to mitigate the effects of rising income inequality. Not only is this politically infeasible, but it would also very negatively impact economic growth. But do we really care so much about income? Or should we care more about consumption? Is it morally problematic that Bill Gates possess billions of dollars, or is it what he gets from those billions (yachts, influence, and safety) that causes the problem of income inequality? It seems, although this is just a first-glance at the issue, that a strong safety net and consumption based taxation goes a long way towards mitigating the problem of income inequality by looking at the problem in a new way. 1. It is poorly targeted relative to alternative policies such as the Earned Income Tax Credit (EITC). And, yes, I am familiar with the argument that the minimum wage and the EITC are complements; what is thin on the ground, so far as I am aware, is evidence of the empirical importance of this argument. 2. As pointed out recently by Greg Mankiw, it distributes the costs of the increased minimum wage in a less attractive way than alternative policies such as the EITC, which implicitly come out of general tax revenue. 3. Most importantly, raising the minimum wage fails to address the underlying issue, which is that many workers do not bring very much in the way of skills to the labor market. Rather than having a discussion about raising the minimum wage, we should be having a discussion about how to decrease the number of minimum wage workers by increasing skills at the low-skill end of the labor market. This would, of course, mean challenging important interest groups. It is also a bigger challenge more broadly because it is less obvious how to do it. But that is the discussion we should be having because that is the one that will really help the poor in the long run, in contrast to a policy that feels good in the short run but only speeds the pace of capital-labor substitution in the long run. None of these arguments are novel, and I’ve cited all of them in the past, but they are worth repeating. Minimum wage: the best you can say is that it’s a really inept and obsolete policy.